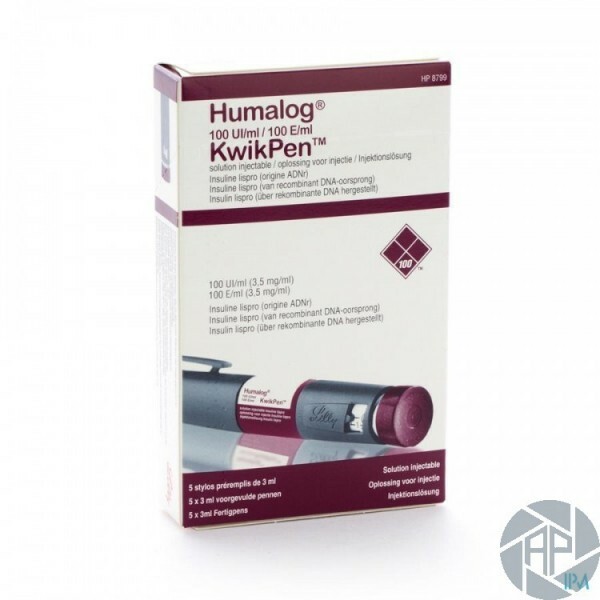 What is Humalog KwikPen (insulin lispro)? Insulin is a hormone that works by lowering levels of glucose (sugar) in the blood. Insulin lispro is a fast-acting insulin that starts to work about 15 minutes after injection, peaks in about 1 hour, and keeps working for 2 to 4 hours. Insulin lispro is used to treat type 2 diabetes in adults. Insulin lispro is also used to treat type 1 diabetes in adults and children who are at least 3 years old. Insulin lispro may also be used for purposes not listed in this medication guide. What is the most important information I should know about Humalog KwikPen (insulin lispro)? How should I use Humalog KwikPen (insulin lispro)? Insulin lispro is injected under the skin, or into a vein through an IV. You will be shown how to use injections at home. Do not give yourself this medicine if you do not understand how to use the injection and properly dispose of needles, IV tubing, and other items used. After using insulin lispro, eat a meal within 15 minutes. If you did not use an injection before the meal, use the medicine right after you eat. If you use this medicine with an insulin pump, do not mix or dilute insulin lispro with any other insulin. Infusion pump tubing, catheters, and the needle location on your skin should be changed every 3 days. Change the medicine in the reservoir every 7 days. Concentrated insulin lispro (200 units) must not be given with an insulin pump, or mixed with other insulins. Do not inject concentrated insulin lispro into a vein. If you use an injection pen, use only the injection pen that comes with insulin lispro. A dose counter on the injection pen shows your dose in units. Do not convert your dose. Attach a new needle before each use. Do not transfer the insulin from the pen into a syringe or infusion pump. Insulin lispro is only part of a complete treatment program that may also include diet, exercise, weight control, regular blood sugar testing, and special medical care. Follow your doctor's instructions very closely. Since insulin lispro is used before meals, you may not be on a timed dosing schedule. Whenever you use insulin lispro, be sure to eat a meal within 15 minutes. Do not use extra insulin lispro to make up a missed dose.